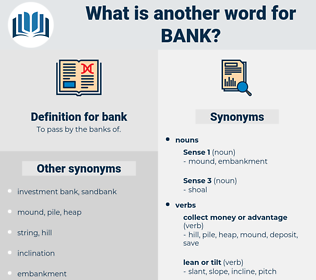 What is another word for bank? To pass by the banks of. 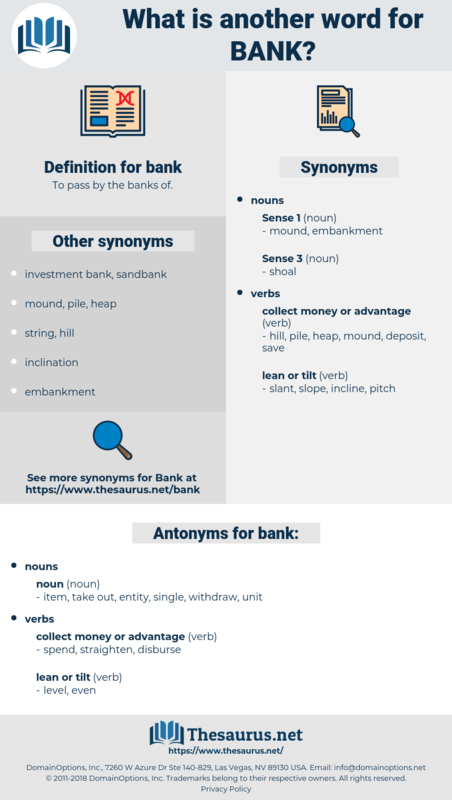 banknotes, organisations, Administrators, merchants, ministers, reservations, danmarks, auditors, Bok, Criteria, Securities, payments, data, owners, notes, directors, decisions, media, needs, Taxes, Bis, tickets, sources, functions, paragraphs, Duties, banca, Fees, Its, banke. item, take out, entity, single, withdraw, unit. Then he came out of the water of the river, and found himself on the bank. After a little I crossed to the left bank. biomass, bouncy, banksia, bones, bunche, bouvines, by inches, buying, banns, banish, bunny hug, by any means, bunce, be amiss, bang, bingo, bonce, bungee, bung, bamako, banning, banausic, bone ash, buffoonish, bankia, banjo, beef neck, bonus, bannock, banke, bench, banshee, bubonic, bionics, bench hook, benzoic, bionomic, benghazi, bunch, bonxie, bhang, booming, beamish, bonanza, baiomys, buoyancy, bangkok, bounce, bunko, bunchy, bns, bemisia, bonk, bongo, bangiaceae, bonsai, bionic, bmus, bangui, buns, banks, bunk, bonyness, beaming, bionomics, banzai, binge, bonasa, bemock, by no means, bemuse, being, bowing, beninese, bunco, Banc, bank check, booyong, banque, bahamas, Banshie, bone age, baboonish, Boniness, bong, babinski. riverside, waterside, sandbank, bluff, riverbank. eye bank, soil bank, blood bank, food bank. cash in hand, reserve, finances, monetary resource, pecuniary resource, backlog, funds, stockpile. enclose, shut in, inclose, close in, cover. work, transact, act, do work.